This weekend saw the two Division 3 sections, North and South, coming together for Rounds 7 and 8. Depending on the pairings, this can give an opportunity to play opponents from the North of England. In fact, six of the eight matches involving Suffolk-based teams were against northern opposition. This photo was taken half an hour before Round 8 was due to start. The sole figure is arbiter Priscilla Morris, checking all the clocks. 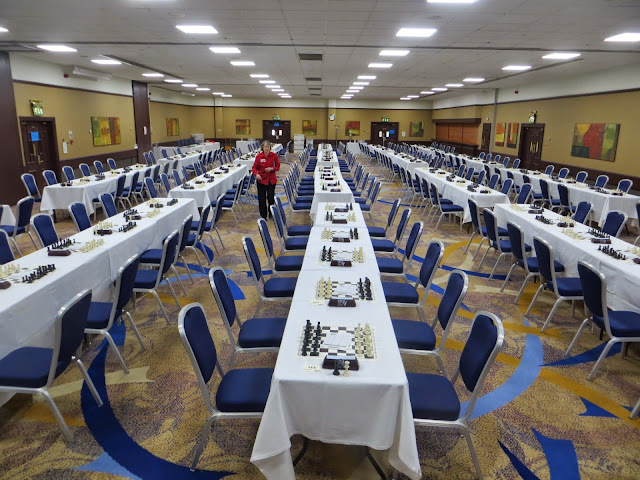 Just think, the huge hall has to be set up - there are 120 chess sets in here, as well as three smaller side rooms that were also used for matches. The team of arbiters, led by Dave Thomas, had to arrive early on Saturday to prepare for Round 7, which started at 14.00. And then, when the last game finished this evening, probably after 17.00, everything needs to be packed away. As a (former) Congress organiser myself, I know what an enormous task this is. And that's not all. Within a day or so of the matches being completed, you can play through the games online. Over the weekend, nearly 350 games were played! Anglian Avengers 2 Drew 3-3 on Saturday, but lost 5-1 today. Anglian Avengers 3 Won 5-1 on Saturday, but lost 4-2 today. Iceni 1 Won 3½-2½ on Saturday and drew 3-3 on Sunday. Iceni 2 Drew 3-3 on Saturday but lost (heavily!) 5½-½ today. The only Suffolk player to win both games was David Brown (AA3). Two results of note on Saturday were Dominic Carter, who beat an 1820, and Alex Sheerin, who beat a 1727.